Your opinion of this dog breed will depend entirely on what end of the leash you are on. With their family, this is a loving gentle giant. With anyone they deem to be a threat, the Russian Bear Dog becomes a dangerous force to be reckoned with. How Big is the Russian Bear Dog? Were Russian Bear Dogs used to hunt bears? Are Russian Bear Dogs used in prisons? How long does this breed live? Do Russian Bear Dogs Make Good Pets? How much are Russian Bear Dogs? Where can I find Russian Bear Dogs for sale? The Russian Bear Dog originated in the Caucasus mountain region where it was primarily used for protecting sheep herds against predators which included packs of wolves and bears. Because of that, fearlessness, protectiveness, and sheer power define this breed. In the United Kennel Club (UKC), this breed is registered as the Caucasian Ovcharka. 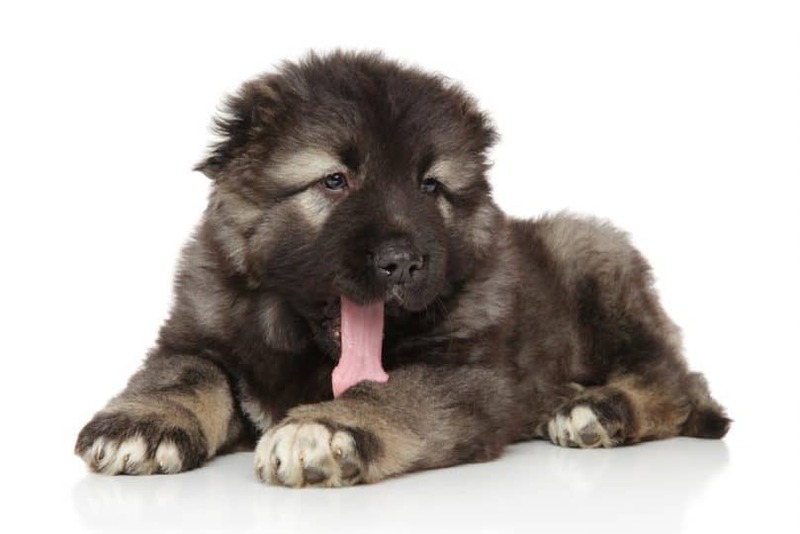 The American Kennel Club (AKC), on the other hand, refers to it as the Caucasian Shepherd Dog. No matter what you call this behemoth of a dog, it’s one that should be respected by all and feared by anyone or anything it considers a threat. These dogs are huge, officially measuring 23 to 30 inches (58 – 76 cm) at the shoulder with some reported to be even larger. They officially weigh in from 99 to 170 pounds (45 – 77 kg), but there have been some that grow to nearly 200 pounds (90 kg). While females will be a bit smaller than their male counterparts, they are still big dogs, and equally aggressive towards strangers. Females with puppies may be even more dangerous since they will instinctively protect their puppies. Although it is unknown exactly where these dogs came from since there are a few theories, it is known that they came from the Caucasus region which is made up of Armenia, Azerbaijan, Georgia, and southeastern Russia. These dogs were bred for their protective nature so that they could assist the shepherds with guarding the sheep. Unlike other sheepdogs, they don’t herd sheep but instead simply protect them. The biggest threat to sheep in the Caucasus region is wolves, so the Russian Bear Dog was bred to be big enough to take on this threat. Most shepherds employed several Caucasian Mountain Dogs to work together to take on multiple wolves. On the other hand, the shepherds needed a dog that knew the difference between an intruder and the sheep themselves. For that reason, there was also a lot of loyalty bred into them. As these dogs were raised next to the sheep, the shepherd, and the shepherd’s family, they learned who was a friend and who was foe. After all, a dog that is just aggressive in general is not very useful. Today, people in the Caucasus region still use the Caucasian Ovcharka to guard sheep, proving that this breed does their job well. It’s also used as a protection dog or guard dog for many other people around the world. While some people may try to keep one as a family pet, the Russian Bear Dog does a lot better when they have a job to do, and is not one that can be handled or trained by an inexperienced owner. If you are considering getting a Caucasian Mountain Shepherd, then it’s important that you know about the care that goes into this incredible animal. After this section on care, there will be some frequently-asked questions about this breed that will help you understand it better and know if one will be right for you. What you feed a Russian Bear Dog will have an enormous impact on the rest of their life. This is especially true when you get one as a puppy. Dogs of this size don’t usually finish growing until they’re 2 years old, which means they need to be on puppy food for that long. But before you grab any old bag of puppy food, take a closer look at the ingredients. Puppies need a high-quality food with the right amount of calories and calcium. Large breeds of dogs like the Caucasian Mountain Shepherd are prone to problems like elbow and hip dysplasia, so it’s important they get the right amount of calcium when they are younger. Although it may seem strange, too much calcium and too many calories are both problematic for young large-breed puppies. They need to grow as slowly as possible to ensure that everything forms properly. This will greatly reduce their chances of developing these bone disorders. Once your puppy has officially grown into an adult dog, you want to continue feeding them a high-quality dog food that will suit their needs. Glucosamine is something that is particularly helpful for preventing and treating a number of joint and bone disorders, something the Russian Bear Dog is prone to develop. 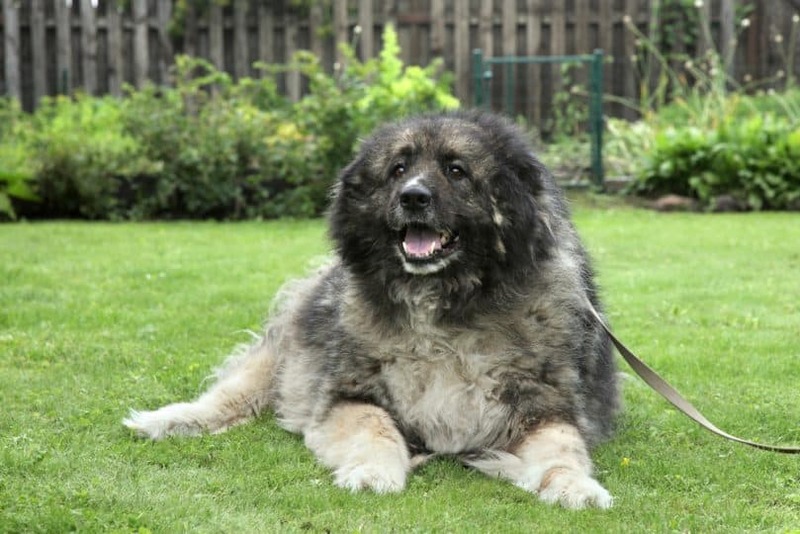 The Russian Bear Dog has a long, double coat which can make it difficult to care for0. How often you have to groom them will depend on the length of their fur and the season. All dogs will need to be groomed more often in the spring. This is when they shed their heavy winter coat. If your Caucasian Ovcharka has shorter fur, then you might be able to get away with brushing them just 2 – 3 times during the week for the rest of the year. However, if your dog has longer fur, then you may need to brush them daily. It’s best to take your dog to a groomer regularly if you’re not going to have the time to devote to brushing them at home. Just remember that this breed should never be shaved. They have a double coat for a reason. It keeps them cooler in the summer and warmer in the winter, but shaving it will take those properties away. If your Russian Bear Dog’s coat becomes tangled, then it’s important to get it untangled as soon as possible. What may be a small tangle today could turn into a huge mat of hair in just a few weeks, which could be impossible to remove. This breed is considered moderately active, which means they only need an hour-long walk every day to fulfill their exercise needs. It’s particularly important to keep the Russian Bear Dog on a leash because you never know what they might turn aggressive towards. If you’re not able to control your dog on a leash, then it’s best to stick to finding things to do in your own backyard. Because of their large size, the Caucasian Mountain Shepherd does best in a large backyard with a fence that’s at least 6 feet (1.8 meters) tall. One way to ensure that your Russian Bear Dog gets enough exercise is to create an obstacle course for them in your backyard. This can be a great way to interact with your dog and exercise them at the same time. Because this breed is intelligent, they can easily become bored if they are not given plenty of exercises, and bored dogs can become destructive or dangerous. So, make sure you are going out with your Russian Bear Dog every day to give them the physical activity they need. Even experienced dog trainers may have difficulty with this breed. After all, the traits of dog breeds that are notoriously hard to train include: independent, protective, guardian, and intelligent. These are all traits that apply to Russian Bear Dogs as well. One of the things they were bred for is independence. While protecting sheep in the field, they are expected to make their own decisions and act without commands. That works well for keeping the sheep safe, but not as well for training these giant dogs. Something else that makes these dogs difficult to train is their aggressive nature. They don’t respond well to certain types of training, and using violent tactics with them could turn them aggressive towards everyone. And this is not a dog that you want to be aggressive. To train a Russian Bear Dog, you need to start as early as possible. This will give you plenty of time to teach them who is safe and who should be considered a dangerous stranger. They need to learn to look to you for direction when deciding if something or someone is a threat. Once you’ve got your dog acting appropriately on a leash, then it will be easier on you to take them out as adults, so long as they’ve been properly socialized and won’t put any other people or animals in danger. While all dogs come with health problems, there are some that are breed-specific. 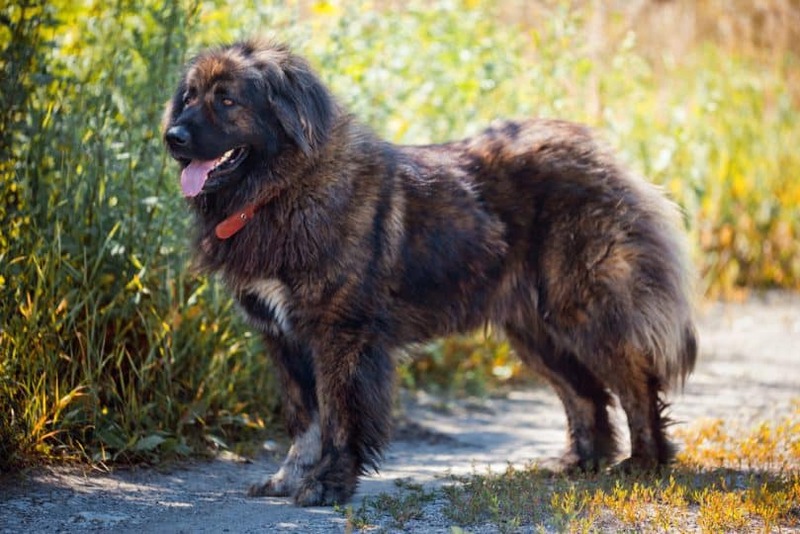 The Russian Bear Dog was bred for health among other things, so they are a healthy breed when compared to others that come with a myriad of issues. Even so, there are two problems that a Caucasian Mountain Dog may face. As previously mentioned, this condition is common in large-breed dogs because of how quickly they can grow to such large sizes. However, even with the best possible nutrition from an early age, hip dysplasia is genetic and can still cause problems for dogs as they begin to age. This condition occurs when the ball joint on the dog’s hip is no longer seated in the socket as it should be. Dogs with hip dysplasia will begin limping and have trouble moving around as well as they did before. This is a painful condition that has limited treatment options. Another similar problem that Russian Bear Dogs are prone to is elbow dysplasia, which occurs in the front leg at their elbow joint. Similarly, it is painful and causes the animal to limp and have trouble getting around. The other common problem faced by the Caucasian Ovcharka is cataracts. This condition causes the lens of the dog’s eye to become obscured. Although some dogs may only have tiny cataracts that barely affect their vision, some dogs will end up going blind because of them. There are some things you can do to limit the chances of your Russian Bear Dog developing cataracts, but there is nothing you can do besides surgery once your dog has them. According to some sources, yes. These dogs were once used to hunt bears. However, it’s not clear if this is completely true or how common this practice was. For the most part, these dogs were used for protecting flocks of sheep against wolves and bears much like the Turkish Kangal Dog. Yes. One of the ways that these dogs are being used today is in Russian prisons. Dogs are carefully selected and trained to recognize the guards as family and the prisoners as threats. These dogs help protect the guards in the event in prison riots or prisoner attacks and make escaping extremely unappealing to the prisoners. If taken care of, these dogs can live for 10 to 12 years. This is a dog breed that is not a good pet unless you are getting them for protection. Because of their unpredictable nature, they should not be trusted with small children in particular. 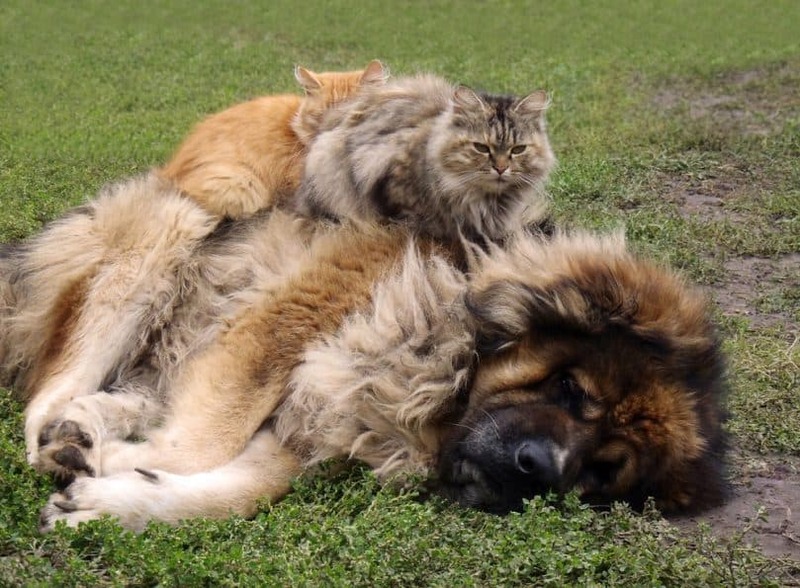 The Caucasian Shepherd make great protection dogs if trained properly, so they may work well for an experienced dog owner that lives alone and wants a security system like no other. Because these dogs are huge, rare, and uniquely-suited for their job as protectors, they can be very expensive. Those which are used primarily for pets or protection animals tend to be cheaper than those which may be used for breeding. If you are looking for a good guard dog, you may be able to find a Russian Bear Dog for as little as $500. If you want a high-quality dog for showing or breeding purposes, you can expect to pay around $4,000 for one. On average, though, a well-bred Caucasian Mountain Dog puppy will sell for around $2,000. I can’t stress enough how important getting a Caucasian Ovcharka from a reputable breeder is. Bearwolf Caucasian Shepherds of Montana in Whitefish, Montana. Esquire Caucasians in Chardon Township, Ohio. The Few Family Farm in Forest Ranch, California. When you find someone listing Caucasian Mountain Dogs for sale, do a couple of quick searches to check them out before pursuing the opportunity further. Breeders of Russian Bear Dogs can register through the UKC and the AKC, making these great resources to begin your search for a good breeder. Not every breeder is going to have their own website, but having one is generally a sign of a good breeder. If they do have a website, they should have quality photographs that give you a good idea of how they operate their business. They should also offer additional information on their website about the breed. This will show that they are knowledgeable about the breed. Something else to look into is how long they’ve been working with Russian Bear Dogs. Since this breed requires so much expertise, someone who has years of experience with them will know how to properly socialize puppies and can help you through the whole process. A reputable breeder won’t have a problem with you coming to their home to see their other dogs, their facilities, and how the dogs are raised. While there, make sure you look around to see how healthy their other animals are and to find out more about the personality of the parents and siblings of the dog you’re interested in. While all dogs are going to be different, many will inherit personality traits from their parents. There are several reasons you need to ask a breeder questions before purchasing a dog from them. First and foremost, you need to make sure that they are experienced with and knowledgeable about the breed. What should I feed my Russian Bear Dog? How can I train my puppy? Where can I find more information about this breed? The other reason you need to ask questions is to ensure they are a good breeder. Such breeder will always take back a dog at any age and for any reason. They are also looking to place dogs in the best possible home, not simply trying to make money selling puppies. What happens if I no can no longer care for my dog? Have the parents been certified by a vet to have healthy hips and eyes? At what age do you wean the puppies? What techniques do you use to socialize your puppies? Which puppy would be right for me? Once you’re satisfied that you’ve found a good breeder, then all that’s left is to put down a deposit on a puppy and then puppy-proof your house while you wait for the call that they’re ready to come home! If you’re still on the fence about owning one of these beautiful creatures, hopefully, these lists of pros and cons can simplify the process for you. Be sure to add your own pros and cons in the comments. So, if you’ve got something that needs protecting and you have the experience and personality to match wits with an intelligent and independent breed of dog, then the Russian Bear Dog could work for you. If you don’t feel like you could handle one of these animals, then don’t worry! There are plenty of other big, beautiful breeds of dog that will be better suited for you and your family. What do you think about Russian Bear Dog? Share your thoughts in comments below! Love your info on this sight except for using tips by Cesar Milan who in the world of professional dog trainers in not well thought of.